When The Current sat down with the 2014 Northwestern Dance Marathon emcees Kelsey Adams and Ethan Levine-Weinberg, they were the calmest they’ve been all week, they said, due to wet weather and sleep deprivation. Under regular circumstances, their combined energy and quirkiness is too much for some people to handle. But we’re convinced the duo has just the right amount of spark to ignite spirits in the DM tent this year. For 30 straight hours, these two students will be responsible for keeping more than 1,000 Wildcats in motion as they raise money for Team Joseph, a nonprofit that funds research for Duchenne muscular dystrophy. 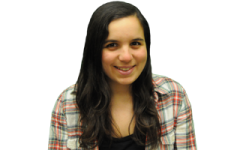 Levine-Weinberg, a Communication senior and personal trainer, joins Adams, a Medill sophomore and amateur psychologist, to keep minds alert and pulses racing through the 40th annual Dance Marathon. The Current: How are you physically preparing for the 30-hour feat that is Dance Marathon? Are you worried? Ethan Levine-Weinberg: Not at all. Last year I wasn’t even tired. It was the weirdest thing. I’m just going to train and get good sleep the week of. Kelsey Adams: 4 a.m. is my moment. That is my prime hour. Last year after NUDM I slept four hours and then pulled another 24 for a Medill project. I do very well with little sleep. It makes me even crazier. I just go into hyperdrive — it’s insane. The Current: What’s your most successful tactic for convincing people to do DM this year? KA: I like to use psych principles in day-to-day conversation. It’s kind of weird. I have this theory that once you get initially involved with something, you’re not going to stop. I told people, “You should at least sign up just so you have the option.” I find that once somebody commits to something, they’re most likely not going to drop it. ELW: For me, I was just at The Rock, skipping over to people and at least getting smiles out of them. I was really happy that most of the people were already signed up. Just the energy and excitement is enough to get people interested. The Current: Do you have any special skills that you think might come out during DM? ELW: I’m really good at catching things in my mouth, so that could come in handy. KA: I’m really, really good at embarrassing myself. I may trip onstage. I’m also really good at egg tosses, if that could happen. The Current: Before DM was a thing that existed in your life, what was the longest you’d ever danced in one stretch? ELW: I’ve been dancing my whole life. I’m dancing right now. When I was younger I’d dance at family occasions, and I always wanted to be one of those party motivators. Being an emcee is like a party motivator on steroids. KA: Probably at a bar mitzvah. The Current: Is there a pop icon or other inspirational figure who you’ll channel on stage in moments of weakness? KA: I channel the purest part of myself. I don’t want to come off as trying to be something I’m not, as cheesy as that sounds. ELW: Bruce Springsteen. I just keep trying to think of NUDM as seven-and-a-half Bruce Springsteen concerts back to back. The Current: What words of wisdom do you have for new dancers and returnees? KA: For seniors, savor every moment of it. If you stuck with something for four years, there’s a reason you’ve done that. This is your victory lap – make the most of it. When’s the next time you’ll be in a tent with this many people? ELW: And for the freshmen who have three more opportunities: You’ll get to do this again — but not with this group of people for this cause. Just knowing the uniqueness of the situation and being there, in the moment, that’s what makes it special.